As the name implies, no-till farming leaves your fields’ soil undisturbed, avoiding the practice of tilling. It has become an increasingly popular practice among farmers looking to reduce costs and improve soil structure, although it takes time to reap the benefits. Keeping crop residue on the surface of the field in non-growing months is a foreign idea to some, but can bring benefits to the health of the field and the environment. 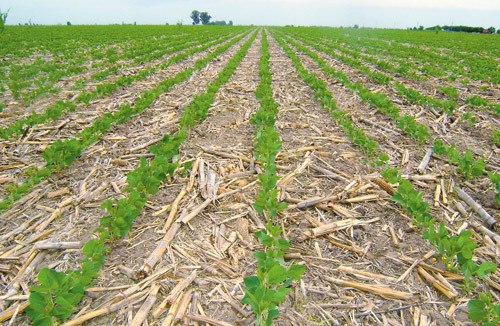 No-Till farming eliminates any disruption of soil structure and release of carbon caused through tillage, and can reduce erosion by allowing rain and melted snow to filter into the soil rather than causing runoff. This farming practice also reduces the amount of heavy equipment in the field, leading to reduced soil compaction. Protrakker Implement Guidance Systems can ensure accuracy and precision in your no-till operation, reducing variability in guess rows and limiting crop damage during cultivation. ProTrakker eliminates planting difficulties that may occur in no-till farming by precisely placing seed, and further saves you costs by eliminating fertilizer, seed and chemical overlap.